As the world transitions from analog content to digital broadcasting, it is in dire need of broadcast switchers. This trend has created a remarkable demand for broadcast switchers in the developing countries of India, Japan, Africa, Ukraine, and Russia amongst others as they are working towards changing their content and conforming to ITU guidelines. According to a research report published by Transparency Market Research, the opportunity in the global broadcast switchers market will be worth US$2.47 bn by 2024, rising from US$1.45 bn in 2015. The market is expected to expand at a strong CAGR of 6.1% between 2015 and 2024. The complicated issues of broadcasting ultra-high definition (UHD) and high-definition (HD) is the foremost reason why users and service providers are adopting broadcast switchers. The growth this market is also being supplemented by the stiffening competition between production houses that has translated into a need for improved production automation technologies for broadcasting content on television. The broadcast switchers market is also being augmented by the rise in the number of sports events being streamed live that require excellent automation for transmitting seamless visuals. In the coming years, the insurmountable penetration high-definition televisions sets will also propel the use of these switchers. The historical analysis of the market indicates that the studio production segment was the largest application segment in the overall market. As of 2015, this application segment held a share of 24.9%. The unique ability of studio production segment with adapt to HD and SD content has made it a popular choice amongst business owners. In the forecast period, the new production segment and sports broadcasting are also likely to make their presence felt in the global market as viewers demand live broadcasts of important events. As of 2014, North America held the largest share in the global market mainly being driven by upgradation of outdated switchers. During the forecast period, North America will continue its dominance in the overall market due to an influx of HD channels. Furthermore, remarkable growth in studio production and sports broadcasting is also anticipated to play a crucial role in the rise of this geographical segment. However, analysts predict that Asia Pacific will surpass the revenue share of North America in the foreseeable future as the region is on the verge of a serious transition from analog to digital broadcasting. The top players operating in the global broadcast switchers market are For-A, Ross Video, Ltd, Grass Valley USA LLC, Evertz Corporation, Sony Electronics Inc., Snell Ltd., Panasonic Corporation, New Tek Inc., Blackmagic Design, and others. According to research analysts, several companies in the market are looking at developing IP-based 4K resolution broadcast switchers to tap the unmet demand for high-quality content in the market. In addition to this, these players will also strive to cater to the varied and unique demands of developing countries to win bigger shares in the overall market dynamics. Broadcast Switchers are the key element used in the transmission of audio and video signals in a broadcasting network. Broadcast switchers are mostly used in production houses (movable and immovable) for selection of signal from multiple signals, sometimes from multiple video sources to create special effect. The global trend in adoption of digital video services and high penetration achieved by T.V sets has boosted the demand for broadcast switchers. This research report on the broadcast switchers market provides detailed analysis of the broadcast industry and helps understand the driving forces behind the popularity of broadcast switchers in the market. It also provides analysis of major sub-segments of the global broadcast switchers market for the next six years. This report includes extensive analysis of industry drivers, restraints, market trends, and market structure. The market study provides comprehensive assessment of stakeholder strategies and imperatives for succeeding in the business. The report has segregated the market based on type, ports, application, and geography. 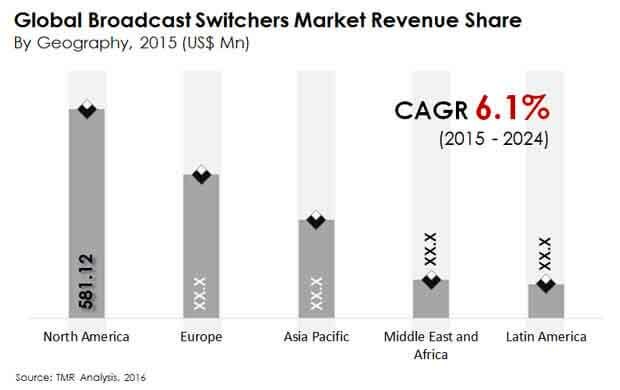 The broadcast switchers market is segmented as follows.